What is it? Deer Creek Public Schools now has a specialty license plate available through the Oklahoma Tax Commission. Not only is the plate an excellent way to show your Antler Pride, it also allows you to support the quality of education for all students in the district. What benefit does the plate provide to the district? $20.00 from the purchase of each plate is returned to the Deer Creek Schools Foundation. These funds will be used to support Deer Creek Schools through grants, scholarships and other financial support for students and teachers. Who can purchase it? Anyone wanting to show their support for Deer Creek Sports and Academics should purchase a plate. Students, parents, grandparents and educators are all encouraged to purchase one! How much does it cost? 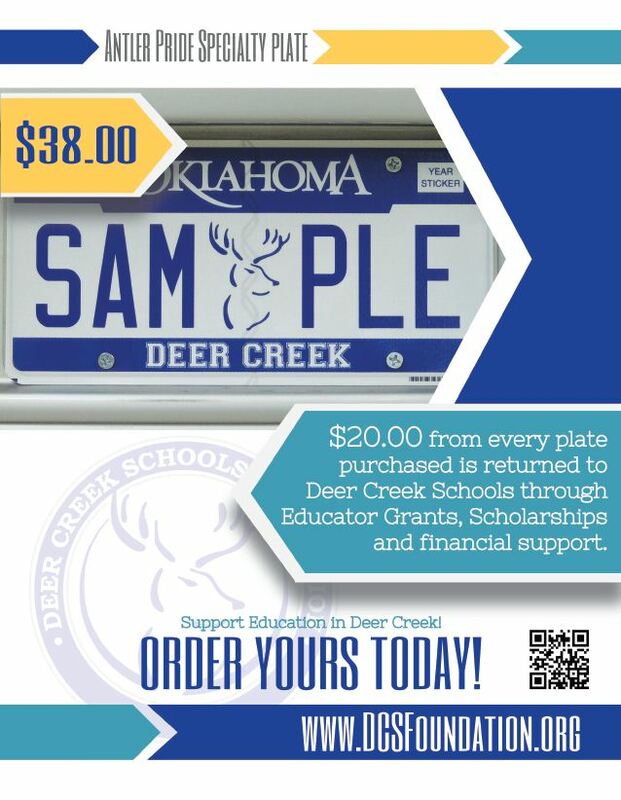 The cost for the Deer Creek plate is $38.00 (per plate) + a one-time $3.00 mailing fee is included in the price for the initial plate order. Is there a recurring charge? Yes, since it is an official Oklahoma license plate each year at renewal you will be required to pay the $35.00 plate fee to the Oklahoma Tax Commission for the use of the plate. Can I personalize my plate? Yes, you can now personalize your speciality plate. The cost for a personalized plate is $35.00 . Who is going to be the first with ANT LR1, DCK IDS, DC4 EVR, DCP RID, 1DC DAD, 1 DC MOM. Have some fun with this and show off your Antler Pride in creative ways! Where do I get my application? Applications are available for download here DC License Plate Application.